Ever Heard of a Baird’s Sparrow? 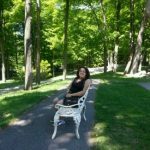 [caption id="attachment_34104" align="alignleft" width="150"] Sharlene Amalu, Guest Blogger[/caption] This blog is written by guest blogger Sharlene Amalu. No, I’m not talking about a certain sea captain and some pearl; I’m talking about the bird Ammodramus bairdii, also known as the Baird’s Sparrow. The Baird’s Sparrow is believed to only have a lifespan of three to six years and is approximately 12cm in length or slightly larger than the size of your palm. Individuals only sing one song out of a possible thirteen songs through its lifespan. They’re tiny birds that really sing! Approximately 60% of the overall Baird’s Sparrow population breeds mostly in the southern regions of the Canadian provinces of Alberta, Saskatchewan and Manitoba while also breeding in the states Montana, Wyoming, South Dakota, and sometimes in Minnesota. During the warmer months, from April to late September, the sparrows breed in habitats with mixed grasses or dense grass regions within crops or hay, and nearly shrub-less prairie settings. Dry wetland basins and wet meadows are also used for breeding. From Late September to late March, they live in the south. Unfortunately, the Baird’s Sparrow has been placed under “Special Concern” after a review in 2012 by the Committee on the Status of Endangered Wildlife in Canada (COSEWIC) and the Species at Risk Act (SARA). 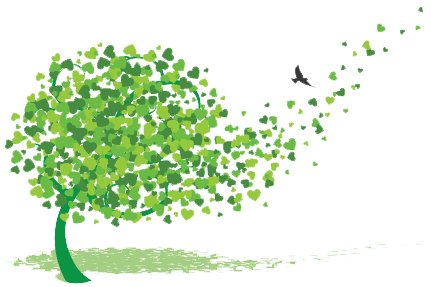 Habitat loss and degradation from various activities such as urbanization, road and energy developments, climate change, invasive plants and the conversion of grasslands to crop lands have become issues. The infrastructure associated with energy extraction and renewable energy projects, in particular, contributes greatly to the destruction of habitat. In the Baird’s Sparrow’s breeding range, the number of gas wells nearly tripled in the last 20 years in Canada. These sites have impacted more than 30,000 ha of grassland habitat and have created 65,000 ha of edge habitat. To meet consumer demand, another 9000 ha of grassland habitat is being predicted to be used per year. 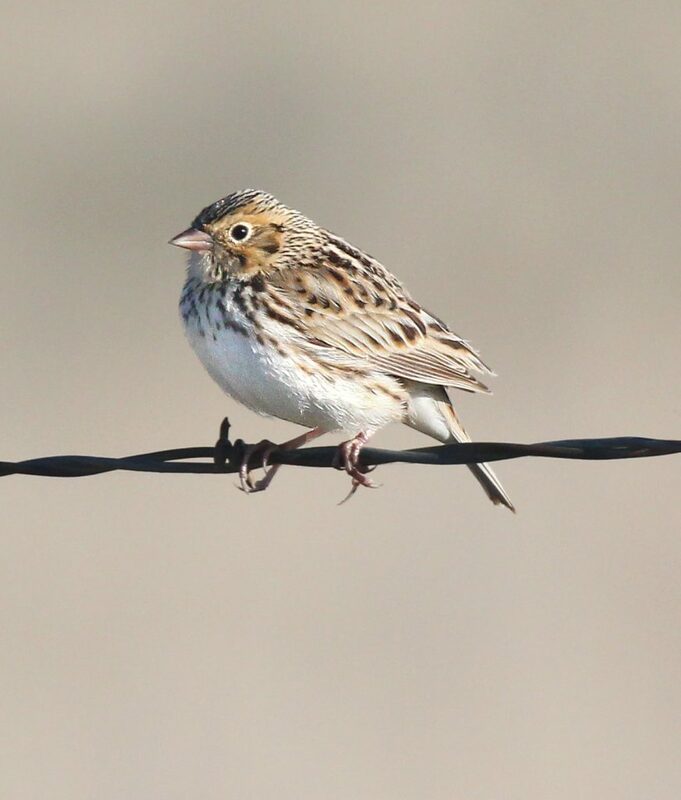 The Baird's Sparrow is also impacted by adverse agricultural activities such as irrigation, pesticides use, and livestock grazing has disturbed natural drought cycles, fires, and changed grassland growth patterns from uniform and intensive grazing. 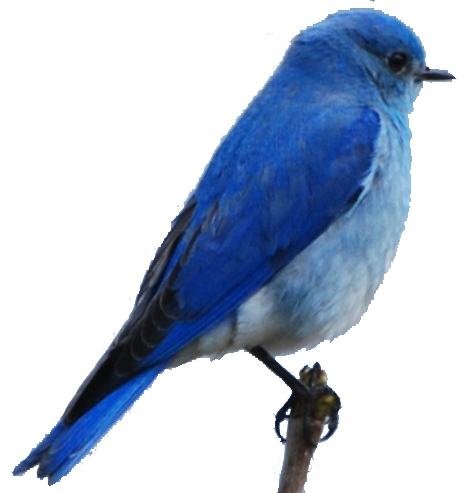 Fragmentation has also made parasitism from cowbirds a problem. Currently, 30% of native grasslands in Saskatchewan are under some form of protection by government and non-government organizations, while in Alberta, just over half of the lands are owned by the Federal and Provincial government. However, management is an issue as these protections don’t stop energy extractions from occurring unless in a National Park or the Suffield National Wildlife Area (Suffield NWA). In the United States, the US Conservation Reserve Program does help protect areas but doesn’t allow grazing to happen, affecting grassland growth. In 2016, the organization Partners in Flight created an action plan to help with the conservation of land birds. 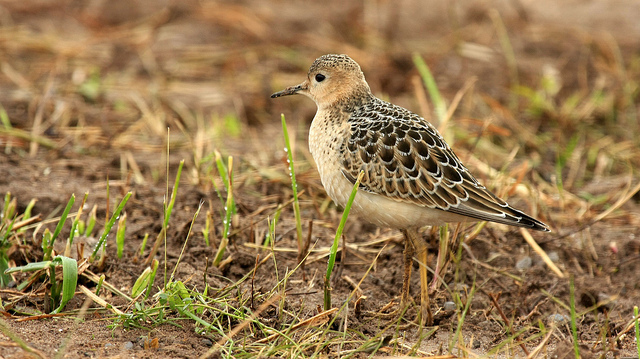 You can read the full article about the action plan click here and can click here to learn more about the 2016 Conservation Action Plan for Landbirds if interested. Want to learn more about this species? Check out our Know Our Species page! It’s a Unicorn! It’s a Mermaid! No, it’s the Narwhal. 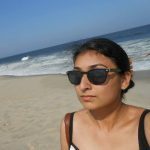 [caption id="attachment_33701" align="alignleft" width="150"] Jasmine Mander, Guest Blogger[/caption] This blog is written by guest blogger Jasmine Mander. Canada’s very own mystical creature of the sea. Meet the Narwhal The Narwhal is a medium-sized whale species, not a sea unicorn as it’s sometimes called, or a mermaid as it’s been mistaken for by sailors for hundreds of years. In fact, the name comes from the Norse word nár which means "corpse". The characteristic long spiral tusk is actually a protruding canine tooth, which can grow more than three meters in length! It’s predominantly a male trait, although a small percentage of females do grow a smaller version of the ‘horn’. Due to their position at the top of the food chain, consuming fish, shrimp and squid, they play an important role in the Arctic marine ecosystem. Home Sweet Home [caption id="attachment_33695" align="alignright" width="493"] Pod of narwhals, northern Canada, August 2005. Image courtesy of Kristin Laidre. [/caption] Their habitat spans across the Arctic waters of Canada and East Greenland. In Canada, this includes Baffin Bay and a smaller but still significant population in Hudson Bay. They travel in small groups called pods and use echolocation to get around. Echolocation allows them to detect ships up to 80km away! Along with their remote location, their tendency to stay away from areas of human activity has prevented this mysterious animal from being studied in captivity. Threats and what is being done Narwhals migrate from coastal waters in the summer to areas of dense sea ice offshore in winters. As a result, climate change poses a potential threat to this seasonal habitat. Currently, the greatest threat is hunting. They are mostly hunted for their skin and ivory. The ivory is sold internationally at a high price while the skin is consumed as food in local communities and is highly valued, though the rest of the meat is not usually eaten. In fact, the demand of Narwhal skin often exceeds supply. 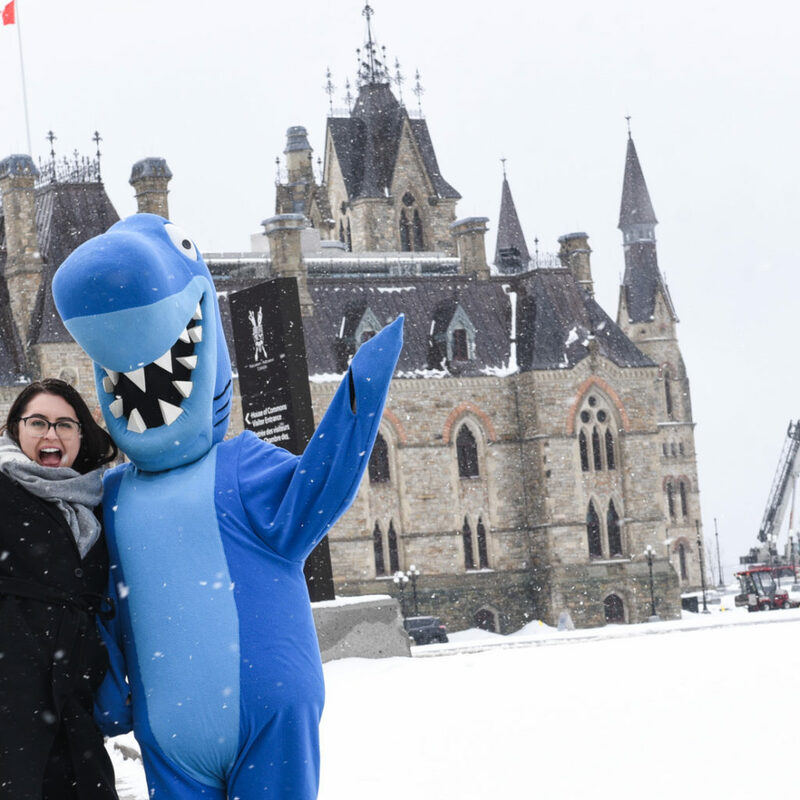 The Committee on the Status of Endangered Wildlife in Canada (COSEWIC) assessment declared the Narwhal as a species of special concern but it has yet to be given a status under the Species at Risk Act. Currently, Narwhal protection in Canada only extends to managing hunting, live capture and the movement of Narwhal products. 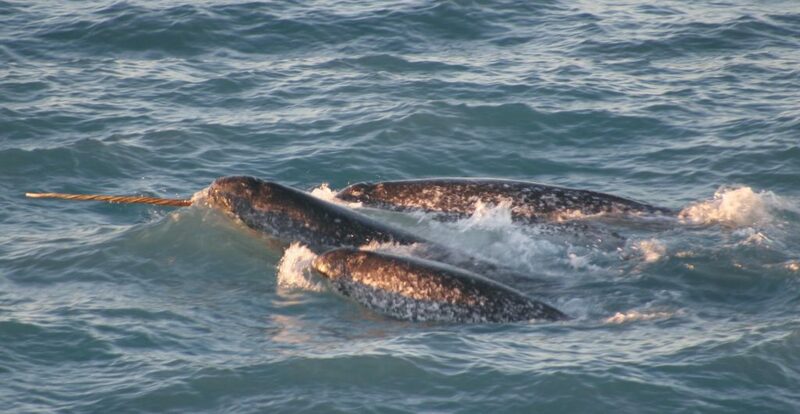 There are no marine conservation or protected areas that protect Narwhals in Canadian waters, though Narwhals can be found in some areas within Nunavut National Parks. Therefore, advocating for the establishment of marine protected areas is an important next step in preserving this unique species. Learn more about the Narwhal in our species profile!